You’ve Got the Tools. Can You Make the Trade? one of the largest in Brooklyn.Cruise ships, mini cinemas, oilrigs, and— wait for it—fish ladders. Is there any place AV integration fears to tread? Specialty integration may be the road not yet taken for many integrators, but with revitalized downtowns sprouting performing arts venues with boutique cinemas, and entertainment options galore on the high seas, it may provide a new opportunity for AV integrators willing to take on the challenges these singular projects require. Impact installations that serve a smaller, more focused number of viewers are certainly on the rise. 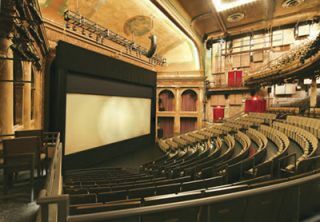 “For simplicity’s sake, you can sort these venues into two general types: multipurpose venues that change based on whether the purpose is to entertain or educate, and dedicated performing arts/boutique cinemas housed in historic buildings that have been upgraded to today’s AV standards,” said Michael Bridwell, director of marketing for Digital Projection, Inc. The rise in venues includes those that from the outset were specified and upgraded to suit multiple uses. Often, this means catering to very different audiences as well. Many boutique cinemas are situated in restored historic structures where an advanced AV upgrade occurred during the renovation. One is the New Orleans’ Joy Theater, circa 1940. The Joy is a prime example of Hollywood’s golden age of cinema. Art house cinemas and community-driven performing arts venues are looking to deliver compelling entertainment via pragmatically chosen, long-life AV components that will serve the community for years to come, he explained. The Santa Clarita Performing Arts Center, for example, is a regionally funded venue, custom-built to amply serve the entertainment and educational tastes of the area. “With a powerfully diverse array of theater and musical productions, the venue enlists immersive projection to create digital sets and backdrops without the fabrication costs of building full sets for each performance,” Bridwell added. Before dipping a toe into the waters of the cruise ship industry, it would be helpful to understand the machinations of this segment of specialty AV integration. Perhaps no one knows it with more depth than Marc Goossens, business development manager of installation markets for Meyer Sound. Prior to joining Meyer Sound, Goossens was senior vice president of FUNA International, which specializes in the design, integration, and project management of large-scale and highly complex AV systems. With a maritime-focused background, he also worked as an electronics officer for Holland America Cruise Line before joining a Florida AV company that was very active in the cruise industry. Cruise ship growth used to be high, Goossens noted, but with the economic downturn, construction of new ships has decreased. Meyer Sound loudspeakers for this market include the smaller, low-voltage loudspeakers, with the aim being to get the most power from a smaller speaker. “This is a small world in which an integrator would have to be known or know someone involved; it’s largely word-of- mouth,” he added. Marshall has provided IP cameras for oilrigs, pipelines, and even fish ladders in the Pacific Northwest where cameras count and record the movements of salmon in high-def. This camera technology, once costing tens of thousands of dollars, is, in many cases, at a fraction of that cost, opening the door of opportunity for cutting-edge imaging shipboard. “Now, this is an affordable value proposition,” Walker said. The cruise itinerary may be planned in advance, but weather is not. For Princess Cruises, one of several cruise clients, Meyer Sound developed the Ultra- Weather Protection option for certain speakers being specified for use outside on an open deck. The MILO high-power curvilinear array loudspeaker is one such speaker and is featured on the line’s Caribbean Princess, as well as several other ships operated by Princess Cruises. a substantial distance while firing into strong headwinds. Meyer Sound’s UltraWeatherized protection feature ensures that the system operates reliably even in the extremely harsh weather conditions at sea.“In addition to the cruise ship market, there has also been interest in the UltraWeather Protection option from other industries, such as theme parks, which can have very similar exposure to sun and an ocean salt environment that cruise ships have,” Goossens said. Like other customers, cruise ship clients want to be immersed in high-quality sound everywhere, and Torlone said One Systems speakers and suspension accessories make it possible for its partners to meet a wide range of needs for high quality sound for outdoor and for indoor applications as well. Another specialty segment being addressed by One Systems is for natatoriums, indoor swimming pools where the environmental challenges are entirely different than in direct weather applications. One Systems natatorium speakers use grilles and hardware made of AL-6XN, a super austenitic alloy that contains six-percent molybdenum, which is immune to stress-corrosion cracking and ensures long useful life without the need for ongoing safety inspections. “Our models have the intelligibility and pattern control necessary to ensure that they’ll deliver outstanding coverage in the highly reverberant acoustical environment of an indoor pool,” he said. to bring high-quality cinematic presentations, including first-run 2D and 3D films on a single screen to audiences. When the screen is stored and the room is put back to its live performance mode, there is no obvious indication that the room has a cinema component at all.There’s nothing diminutive about the 831-seat cinema venue, known as the Steinberg Screen at the BAM Harvey Theater, but it’s a special spot. Opened in 1904, the venue went through various incarnations, including a period when it was shuttered, before its major renovation in 1987. Designed for live music, drama, and dance, a very recent technical revision was needed in order to accommodate BAM’s desire to bring high-quality cinematic presentations, including first-run 2D and 3D films on a single screen to its audiences. Enter Auerbach Pollock Friedlander, working with BAM and Mitchell/Giurgola Architects to realize BAM’s vision by providing theatre and audio/video consulting for digital cinema projection and also for new seating. The installation involved a great deal of custom design and coordination by APF senior associate and AV project manager Daniel Mei, with rigging design and theatre consulting project management by APF senior associate Don Guyton and principal in charge Steven Friedlander. The challenge was to be able to turn the auditorium into one of the best venues for cinema without compromising its value as a space for live performance. The design, which required many months of planning and design, was brought to life by AV and cinema systems integrator Boston Light and Sound. Careful coordination with manufacturer Stewart Filmscreen ensured the successful installation of the specified roll-up, 35-foot-wide screen that is stored below the stage. When the screen is stored and the room is put back to its live performance mode, there is no obvious indication that the room has a cinema component at all, with the exception of the presence of the surround-sound loudspeakers, and even these can be used for special-effect purposes for theatrical events. A series of motorized adjustable acoustic banners were designed in conjunction with the project acoustician, Akustiks. The acoustic banners allow the overall reverberation time of the theatre to be reduced which, in turn, increases intelligibility of the film’s dialog track. The banners can be controlled individually or in groups to adjust the absorption as needed for each given presentation. Even with the rise of large-screen TVs and home theaters, the experience of going out to a movie, especially in a theater that boasts such a large screen and immersive sound system, and sharing the space with other theater-goers, has a great appeal to true fans of cinema, he noted. Having the cinema available has allowed BAM to schedule off-season events such as the BAMcinemafest, and a full year-round schedule, providing additional revenue stream. There is a market for specialty cinema installations that goes beyond the multiplex—historic former cinema venues, special museum screening rooms, art houses, and film festivals.